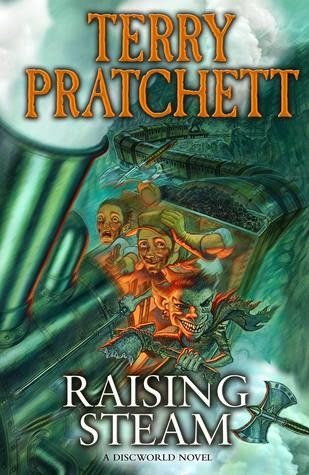 Today's quote comes from Raising Steam by Terry Pratchett. It isn't so much my normal quote about the love of books or libraries but rather about people/dwarfs/trolls who love books. It also seems appropriate for Library Lover's Day which is today. The quote comes from pages 244 and 245. Enjoy! The rain poured down on the Sto Lat terminus, water gushing off the roof as people scurried to get out of the downpour, seeking a respite from the deluge. The little coffee shop of Marjorie Painsworth was dry and as an extra attraction on this dreadful night she had warm buns on sale. It was a beacon of solace for the young troll lady, who stirred her cup of molten sulphur uncertainly while waiting. She watched people coming in and out, and was surprised when a dwarf gentleman indicated the chair next to her and said, "Excuse me, is this place taken?" Crackle had never had much to do with dwarfs, of course, but since the whole Koom Valley business had been sorted out, it was surely in order for her to talk to a dwarf, especially since this one was very well dressed and, well, looked human; an Ankh-Morpork dwarf as they called them. So she smiled and said, "By all means do take a seat, sir. Isn't the weather inclement for this time of year?" The dwarf bowed, sat down and said, "Forgive my intrusion, but I am so happy to hear you use a word like "inclement". The very word itself paints a picture, don't you think? A grey one, but nevertheless....Oh, where are my manners? Please let me introduce myself: Dopey Docson at your service, madam, and may I say you speak extremely good dwarfish?" Crackle looked around. People were still coming in out of the rain and leaving as the trains came and went. Sto Lat as, after all, a hub of the railway and almost all traffic passed through there. She had one ear cocked for the porter announcing her own train, but she managed to say, "Your grasp of troll is likewise also remarkable, if I may say so. May I ask where your travels have taken you?" The dwarf smiled again and said,"I'm a librarian in Klatch, but I've recently buried my father in Copperhead." And Crackle stifled a laugh and said, "Do excuse me, I'm very sorry to hear about your father, but that's amazing! I'm also a librarian, in the service of Diamond King of Trolls!" "Ah, the Diamond Library! Alas not available to us at the moment, even under the famous Accord. I'd give anything just to see it." And the two librarians ordered more drinks and talked about books while whistles blew and train after train left the station. Crackle told Dopey that her husband didn't like books and considered that mumbling should be good enough for trolls like it was in the old days, and the dwarf told her about his wife who even after the Koom Valley Accord still thought of trolls as a kind of animal, and they talked and talked and talked about the meaning of words and, indeed, the love of words. Marjorie recognised the syndrome and kept the hot coffee and sulphur flowing, with the occasional warm rock cake. Of course, it wasn't her business, she thought, it wasn't up to her how other people led their lives and she definitely didn't eavesdrop, well, not much, but she couldn't help hearing the dwarf say, "I've been offered a post as librarian at Brazeneck University and they've already told me I can bring my own assistant." And Marjorie was not surprised to find two empty cups and an empty table when she next looked: this sort of thing was bound to happen with the railway. It expanded horizons, inside and out, people went looking to find themselves and what they found was somebody else.